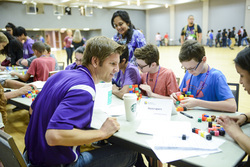 Dr. Keith Hubbard, professor in the Department of Mathematics and Statistics, helps students work on a skyscraper puzzle at the department's first Julia Robinson Math Festival. NACOGDOCHES, Texas - Sixth through eighth grade students from local schools recently spent the day at Stephen F. Austin State University exploring math with the help of faculty and students at the university's first Julia Robinson Mathematics Festival, hosted by the Department of Mathematics and Statistics. Supporting locally-organized events across the country, the festival aims to inspire kindergarten through 12th grade students to develop problem-solving skills through math puzzles, problems and games in honor of the late Julia Robinson, the first woman mathematician to be named a member of the National Academy of Sciences. "The festival is in keeping with the mission of the STEM Research and Learning Center and our desire to provide access to positive experiences with mathematics for students in our area," said Dr. Jane Long, associate professor in the department. The festival also gave SFA students the chance to interact with middle school students in a "comfortable, no-pressure atmosphere," Long said. Throughout the afternoon, participants worked on nonstandard problems and questions designed to teach them to collaborate and think creatively, like acting out the swarming patterns of ants and estimating how many popcorn kernels could fit in the Student Center Grand Ballroom. "Mathematics is a lot more than memorizing rules," Long said. "Ultimately, success in mathematics and STEM fields requires students to think effectively, especially when it's not immediately obvious what to do."